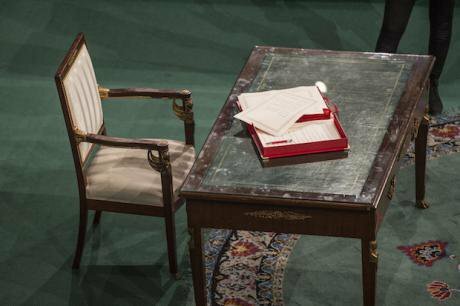 Empty chair where the deputy of the National Constituent Assembly will sign a copy of the constitution during a ceremonial closing session of the parliament in Tunis, Tunisia, on November 20, 2014. Picture by Bresillon Thierry/ABACA/PA Images. All rights reserved. A cold night. The streets were empty and a large military car on patrol was slowly advancing towards us. The vehicle stopped and a young soldier shouted: ‘There is a sniper around your neighborhood’. He asked for a cigarette, and before leaving advised me and my two other friends to vehemently protect our district, to avoid open spaces, to stick to the walls, to run when crossing the streets, and to go to the military barrack if one of us gets shot. It was the night of Monday, January 17th 2011, three days after Ben Ali, the Tunisian despot, left his country, following a month of popular protests. The state and its structures could not handle the sudden departure of their abductor. Governmental offices closed, police stations were left empty and the army imposed a 12 hours curfew. Only certain groups of men were allowed by the military to protect their neighborhoods at night. In this heavy atmosphere of uncertainty, on the Friday prayer of the same week, and for the first religious sermon that was not dictated by the state, the imam of our local mosque started by thanking God for this moment of ‘glory’ and then delicately avoided uttering a single word about the collapsing state. Instead, he offered a long, energetic and unexpected speech on the signs of the end of times. The question here is not ‘how’ did they join ISIS but 'why'? He gave a clear description of an apocalyptic animal, an enormous winged snake that will emerge somewhere near the Muslim sacred cities of Mecca and Medina, and that we, good believers, had to expect its immediate arrival. Before finishing, in a last and intense note, the Imam warned us of ‘the system of Ben Ali that survived him’. And here, our local apocalyptic predictor was right. The real enemy of his legendary flying snake was the old giant Golem of ‘the system’. A contrast. A mythical battle between an insipid bureaucratic state from one side and the vivid, global, radical apocalyptic project from the other. Immediately after the revolution, when liberals promised local democratic reforms, Islamists planned an empire, predicted the end of the world and promised nothing less than heaven. It is there, I think, that lies the reason behind this rather intriguing fact: Young Tunisians formed one of the biggest contingents of foreign fighters in ISIS. People holding Islamic banners during celebrations for the first anniversary of the Tunisian revolution. Picture by Fauque Nicolas/ABACA/PA Images. All rights reserved.The question here is not ‘how’ did they join ISIS (the answer to this would have local and regional geopolitical implications that are hard to tackle here) but ‘why’? What made the idea so appealing, irresistible? What happened in Tunisia before, during and after the revolution that made the Islamist morbid utopia seem possible and attractive? Different reasons were proposed to explain the appeal such ideas had on young Tunisians: poverty, lack of education, a patriarchal society, a distorted version of Islam, or all accumulated. But the facts are here and they often contradict all the proposed reasons: Tunisian ISIS fighters were in many cases, young, middle class or rich, educated men and women. 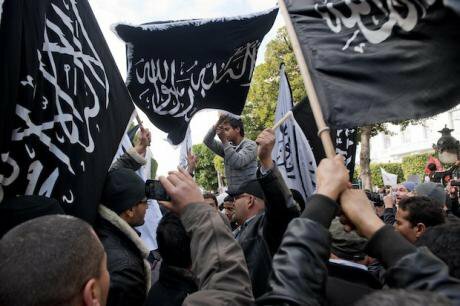 The reason behind the appeal ISIS has lies elsewhere: namely in the novel form of dictatorship that characterized Tunisia and other Arab regimes in the last three decades. A voided, legalistic and bureaucratic dictatorship. Let me explain. Ben Ali, who took power in Tunisia after a palace coup in 1987, was hardly a dictator in the ‘classical’ definition of the term. He was before anything else an army general who, in the name of state pragmatism, refused any form of ideology. His regime was neither officially Islamic nor openly secular. It is impossible to situate him. He maintained a well-crafted confusion around his larger political project, or any ideological affiliation he would have belonged to. Ambiguity was perhaps his motto; he exiled Islamist leaders then built an enormous mosque near his palace, started a national campaign to help the worker and the poor then incarcerated the leftist leaders of the country. He did not propose an ‘ideal’ to follow, a ‘supra-national project’ that will legitimize repression (a classical tactic of previous or contemporary despots).More than a dictator, he was a colorless bureaucrat, who hated speeches, was uncomfortable in crowds, avoided public appearances and spoke to his people in their dialect only once in 23 years; it was the night before his overthrow. And for two decades, Ben Ali claimed being a democratically elected president, and that his regime defended freedom and human rights. For his followers, all was legal and constitutional. But for many Tunisians, he was nothing but a clumsy despot, constantly refusing to take a name, impossible to categorize, to understand, to love, or even to resist. 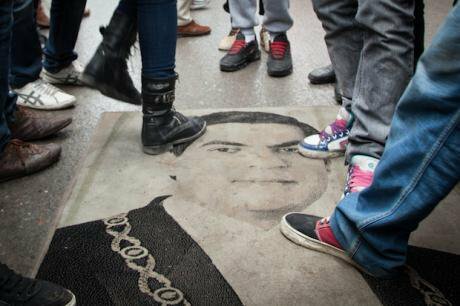 A rally marking the third anniversary of the uprising that ousted long-time dictator Zine El Abidine Ben Ali on January 14, 2014 in Habib Bourguiba Avenue in Tunis. Picture by Palacio Marieau/ABACA/PA Images. All rights reserved.Here is an example of this ambiguous form of legal repression with velvet gloves that he adopted: In Tunisia, and against all odds, protests were always allowed. Even during the worst times of dictatorship, it was theoretically possible to protest. You should simply ask for permission. In 2009, a friend participated in a small protest in the central avenue of Tunis. He was immediately arrested and tortured for one night. The day after, a young police officer visited his jail cell and softly explained that it was his right to protest, ‘but you simply had to follow the law’, he explained. For that, first you needed to be a legally recognized political, labor or civil entity. If you are not, then you have to fill a demand to the ministry of interior to be recognized as a ‘legal body’. If approved, you are then perfectly eligible, according to the law, to make another demand. This last document, if obtained, will permit you to protest in front of the ministry of interior against the control on freedoms exerted by the same ministry of interior. This is not the start of a Kafkaesque novel, rather the beginning of a path that leads to a suicidal boredom. This same friend joined the ranks of ISIS in 2012. He finally protested; against the Tunisian regime, by killing civilians in Syria. In the 2000’s, it was therefore an empty, bureaucratic, legalistic state that was created, where all forms of ideological projects were softly, silently, slowly repressed and stemmed outside. The nationalist project was worn out, the socialist alternative lost its power of appeal, the Pan-Arab solution was a mirage, and we watched on TV the communist ideal falling with the Berlin Wall. Local politics was then voided of all substance and transformed into mere management. All radical social projects, all ideologies were annihilated and smothered by an infinitely layered cope of seemingly objective laws. It was a ‘legal’ dictatorship, with an artificial parliament, a pro-government political opposition, docile human rights associations and regular elections. The dictator gesticulated in a democratic decor. And Tunisians watched the sad play every night, on the news, at 8pm. This particular type of soft and bureaucratic dictatorship leaves behind it a general feeling of bitter powerlessness. Feeling stifled from all sides yet unable to define the enemy, to face it, to fight it. The criminal is hidden behind tons of papers, documents, regulations, rules, laws that are fundamentally rational, artificially neutral, that are hard to oppose or refuse. It is this voided, confusing form of an ‘elusive dictatorship’ that created the empty containers that were many Tunisians; citizens of a country where all political ideologies disappeared. Some of them self-referenced themselves as simple non-political ‘khbozist’ (bread-earner). As if consumerism was a possible narrative for all, as if ‘eating bread’ could seriously and simply be the project, the dream, the ‘raison d’etre’ of an 18 years old man or woman. And then a revolution. A cataclysm. The revolutionary moment of 2011 was for us a call for a real alternative, totalizing as it may be. A call for a fresh form of political representation, for a new system that will dismantle and replace this utterly monotonous bureaucratic state. The revolution was a clear call for a common project, that will be new, radical, fresh, powerful. Something to live for and to die for. Those Tunisians filling the streets, witnessing the slow collapse of the dictatorial castle, raising up their empty hands, waiting for nothing less than a messiah, a book and a miracle. In that mystical moment of intense expectation for an alternative, those Tunisians were offered more reforms. Yes. More laws, articles, a still ambiguous new constitution and some other administrative, political and juridical changes. In the revolution of 2011, within that cacophony of newly created parties, associations, and unions, all calling for reforms, only one player was proposing an ideology, a real one. Only one player did not aim at simply continuing the small projects Ben Ali was too weak to finish but aimed to create an empire, the largest in the world, and promised to make of everyone a citizen of this new state or of its up-above corollary: heaven. This player was a newly born group: ISIS. It would be misleading to think that Islamism ‘itself’ was appealing. It was the intense, emotional, energetic and empowering character of its discourse: the mythical, yet possible mission it proposed, its ritualistic components and its claim of a hidden old ‘knowledge’ that could be recovered and utilized. It was the approachable, understandable yet magical sermons offered in mosques. A ‘brotherhood’ led by the mystical figure of a leader, hiding, somewhere in Iraq. The new discourse was a subtle play between the inaccessible, the possible, the metaphysical and the real. In total contrast with the surrounding ‘managerial politics’, radical Islamism was simply ‘fun’ and if Green Peace has offered a similar discourse to the young Tunisians immediately after the revolution, we would probably have had today an army of Tunisian ecology militants, fanatically chasing whaling ships in the sea of Japan. The ideology of ISIS does not offer punctual solutions to specific problems. It takes charge of you. Completely. It channels your questions about life, and afterlife, organizes your relationship to everything, from your daily routine, to sexuality, to death, and most importantly to history. Centuries are malleable and ISIS is able to magically erase a thousand years in the leap of a five minutes propaganda video. Five minutes and you are not that random, unneeded young Tunisian citizen, you are now transported into the 7th century where you can almost see and touch the Prophet Muhammad and his companions during the times of the Islamic conquests. A deep voice speaks to you in a perfect classical Arabic and asks you to finish the project that started fourteen centuries ago. Between you and Muhammad is empty, white, blank, irrelevant space. Everything that happened was mere preparation for your coming, oh you soldier of the last caliphate! It is now your duty to pull and tie the centuries together; it is the role that was chosen for you. You believed in God all your life, now it is God who believes in you. 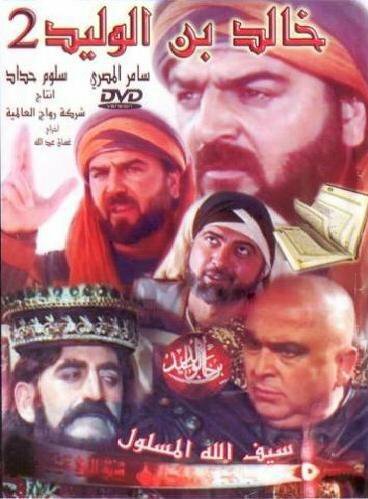 The historical drama Khaled Ben Al Waleed.Those of us who are familiar with the famous historical-religious soap operas that are watched all over the Arab World during the holy month of Ramadan will inevitably notice a similarity between them and the ISIS propaganda videos. The aesthetic of the shows retracing the life of the Prophet or some of the early Muslims was copied by ISIS ‘designers’ for their videos. The same heroic music, the sound of swords (one of the most famous songs repeated in ISIS videos is called ‘the clanging of our swords’. ), the sound of horses neighing and galloping. The use of a classical old Arabic in conversations and the deep digitized voice reciting Quran. Then in the recruiting video, an ISIS member will appear, long haired, bearded and turbaned. He will speak to you in a perfect Arabic that you only hear in the TV shows, and advise you to join the ‘brothers’. It is all too familiar and the message is clear: you liked last year’s show and liked its heroes? You felt connected to that 8th century Muslim war general and wished you were there with him fighting the Byzantines? You enjoyed the love story that went with it? It is not too late, the next season is already here and it is happening now, take your luggage and the first plane to Syria. And you will be, by the grace of God, a character in your favorite show. Still from ISIS video By Alibaba2k16 (Own work) [CC BY-SA 4.0], via Wikimedia Commons.The ISIS ideology does not situate its subject only within a large historical map. It also places ‘him’ within a prophetic apocalyptic future. Apocalypse is here, they said. And when everyone saw in the fall of Ben Ali and Mubarak the end of dictatorship, our local Imam and his ‘brothers’ saw in it nothing less than the end of times, bluntly. As a matter of fact, the most recurrent saying of Muhammad used by ISIS in their videos is a prophecy. A hadith attributed to the Prophet where he predicts the moral development over time of the Islamic caliphate: from the first one that will still follow the manner of the Prophet, to a sick ‘distressful kingdom’, then an evil ‘proud kingdom’. According to this prophecy, the last caliphate, like its ancestor, will follow again the ‘manner of the Prophet’. The hadith ends there, implying that the restoration of the righteous kingdom signals the end of times. The interpretation was too easy: the fall of the Arab dictators was the end of the ‘proud kingdom’ and the logical sequence is the coming of the ‘last caliphate’. Then a final global Muslim victory, a short silence, then heaven. Now, do you want to look like your favorite show character, to join a team of young motivated men and women who were told by God and his Prophet that they will soon establish a caliphate that goes from Spain to China, that they will bring peace to earth and at the same time announce apocalypse? Or do you prefer to take this new internship position, offered by the state, for young unemployed candidates, in preparation for a possible affectation, that will hopefully come by the end of 2019? It is all your choice. Ask this question to a young Tunisian in 2011, who lived under the rosy sky of the revolution and who thought that if ‘he’ could move a dictator, ‘he’ could also, by the same impetus, reorganize history and readjust geography. Ask ‘him’, and you will find ‘him’ a few hours later murmuring prayers in the waiting line for the direct flight to Damascus. 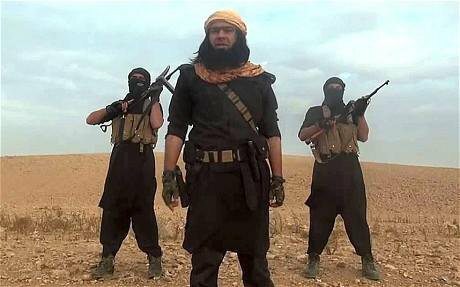 Today in the news we hear that ISIS is living its final days, and killing hundreds in its post-mortem erection. A good news. But wiping ISIS to the ground will maybe stop this particular group from existing. Utopian religious radicals, however, will consider it as a momentary strategic retreat, another chapter preparing for their final metaphysical victory. After all, it is God who told them they will win. How can the pentagon prove God wrong? All military victories are maybe killing a monster but also preparing for its resurrection in a new form usually more violent, wilder and more confident that the time will finally come where it will be the right one. Resisting ISIS and its possible following versions should not only be military. It has to come through the creation of an alternative: a new and healthy general project, cross-social in its scale, ideological in its nature, able to organize the individual’s past, help him and her interpret the present and guide them towards a foreseeable bright future. A project that gives its subject a place and a meaning within a wholesome national or global community, offers him and her a sense of belonging and the ensemble of narratives, beliefs and heroes that go with it. All these elements were at different times insured in the Arab world by the resistance to colonialism, by a postcolonial nationalism, Pan-Arabism, political liberalism, Communism, Socialism, etc. For the last three decades, we faced the death of the political in its ideological form. Replaced by a narrow state pragmatism. If nothing is constructed to replace these dead or agonizing political narratives and as long as radical Islamism remains the only well functioning ideological construct in the region, then countries of the Arab world will continue to produce, at the dawn of every failed revolution, a number of people who will want to give meaning to their lives by taking the lives of others. It will continue to bring out a number of predicators who will promise the empire of God where young men are a thousand years old, where women are buried and snakes fly. At the dawn of every revolution we will have a number of young men and women who will prefer to die in public, instead of living anonymously.